I saw my first atom on a field trip to a laboratory at Le Moyne College, Syracuse, NY. The laboratory did research in field ion microscopy. As I wrote in an earlier article (Imaging Atoms, September 26, 2012) and an article in a general interest magazine, When scientists talk about "seeing" atoms, they just mean that they've seen some representation of them on an imaging screen. Sight involves sensing reflected light from an object with our eyes, sometimes with this light being magnified in an optical microscope. I didn't really see any atoms, since there was no direct linkage to the human sense of sight. The Belgian surrealist artist, René Magritte summarized this idea in his oil painting, The Treachery of Images (La trahison des images, 1928–1929), in which he painted an image of a smoker's pipe with the caption, "Ceci n'est pas une pipe" ("This is not a pipe"). Magritte's painting is an image of a pipe, and not a pipe. This is not Albert Einstein. Rather, it's a very nice image of Albert Einstein during a lecture in Vienna in 1921. I would have shown René Magritte's The Treachery of Images (La trahison des images), but this is a copyrighted work of art. You can view a low resolution image of his painting at Wikipedia. Field ion microscopy images the atoms of sharp metal tips of less than about 50 nanometer tip radius in a vacuum chamber backfilled with an imaging gas such as helium, argon, or neon. Preparing these sharp tips is an art in itself that involves etching and electropolishing in an electrolyte. Application of a high positive voltage of the order of that used in a cathode ray tube (5-10 kilovolts) with respect to the phosphor screen will ionize atoms of the imaging gas close to the tip. These positively-charged ions are repelled by the positively-charged tip in a direction perpendicular to the surface of the tip, and they will form a magnified image of the tip on the phosphor screen. Since a metal tip is an electrical conductor, its surface is at a constant electrical potential and the electric field lines must be perpendicular at every surface point. Since the tip is very sharp, the electric field lines have a large angular divergence and there will be a large field gradient at the sharp tip. Field ion imaging is enabled by this intense electric field gradient, which accelerates the ions in straight paths away from the tip. Physicists are often criticized for their "spherical cow" models, but there's a very instructive model that uses spheres to approximate the geometry of a sharp tip to explain electric charge bunching at the tip (see figure). While such imaging uses field emission of ions, emission of electrons allows the creation of useful devices, such as the vacuum tube, a component that defined electronics through the 1950s. In vacuum tubes, electrons are emitted from a heated cathode by thermionic emission, but thermionic emission isn't the only way to generate an electron beam. Fig. 1 of US Patent No. 3,755,704, "Field Emission Cathode Structures And Devices Utilizing Such Structures," by Charles A. Spindt, Kenneth R. Shouldersand Louis N. Heynick, August 28, 1973. A few improvements have been made to Spindt's concept since the 1970s. In 2011, a research team from Vanderbilt University made a field emission device from diamond, a material with an extremely low work function, so it will produce field emission electron beams at low voltage. [6-7] The properties of planar field emission devices are so similar to those of transistors that many such devices are being called vacuum transistors, an example shown in the following figure. A vacuum channel transistor created by the NASA Ames Research Center (Moffett Field, CA). The spacing between the electron emitter and collector can be made as small as 150 nm, which allows operation at less than 10 volts. This spacing is so much smaller than the mean free path of electrons in air that this vacuum transistor doesn't really need a vacuum. 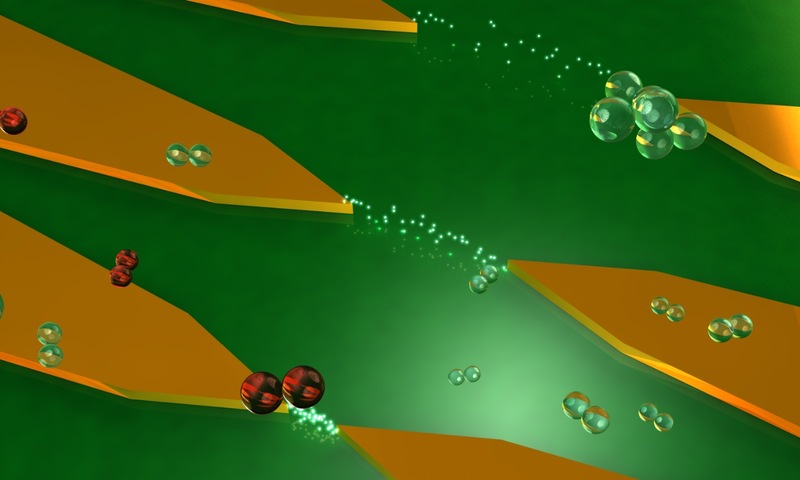 The Functional Materials and Microsystems Research Group of RMIT University (Melbourne, Australia) have used the concept that electrons will easily transit a gap between electrodes in air when the gap is very small to make a field emission air channel transistor (ACT). [9-11] Operation in air is possible since there is little likelihood that the emitted electrons will collide with an air molecule. The mean free path of the electrons is much larger than the gap. Artist's conception of electron transport in air channel transistors (ACTs). The electron transport between electrodes is generally unimpeded by occasional gas molecules present in air. RMIT University, Melbourne, Australia, image. The exceptionally low power and high frequency operation of these ACTs arises from the unimpeded transport of electrons from one electrode to the other. [9-10] Electrons moving through a semiconductor will interact with its atoms, which slows their travel and produces heat from energy loss. These devices are fabricated with electron beam lithography, and this allows a gap spacing of less than 35 nm between tungsten, gold, or platinum electrodes. There's a bottom metal gate to control the field emission, and the ACT devices can be fabricated on any dielectric surface, as long as the this dielectric allows penetration of the bottom-gate field. Since the source and drain electrodes are symmetric, the ACTs are bidirectional. They operate at voltages ≤2 volts at currents in the tens of nanoamperes range. With tungsten and gold electrodes, the limiting process is Fowler–Nordheim tunneling, while platinum electrodes exhibit Schottky emission. The theoretical frequency limit for ACT devices is in the terahertz range, which is 10 thousand times as fast as semiconductor devices. One problem is that the metal tips of the electrodes experience localized melting from the high electric field strength. This blunts the tips and reduces the emission efficiency. Current-voltage (I-V) curves at various gate voltages for an air channel transistor. (Created with Gnumeric from data in ref. 9). Another advantage of ACTs over conventional transistors is that their fabrication is essentially a single-step process of depositing the emitter (source) and collector (drain) electrodes spaced by the required air gap. The complex semiconductor transistor fabrication steps of doping, thermal processing, oxidation, and silicide formation are unnecessary. As Shruti Nirantar, a Ph.D. candidate at RMIT and an author of the paper describing this research, remarks, "Devices can be built on ultrathin glass, plastics, and elastomers... so they could be used in flexible and wearable technologies." Just like vacuum tubes, the ACTs are radiation resistant. C. C. Schubert, "Field‐ion microscopy in colour using multiple imaging gases," Journal of Microscopy, vol. 95, no. 3 (June, 1972), pp. 467-469, https://doi.org/10.1111/j.1365-2818.1972.tb01050.x. D.M. Gualtieri, Cyborgs and Atomic Microscopes, Phi Kappa Phi Forum, vol. 84, no. 2. pp. 6-7 (Spring 2004). H S Fricker, "Why does charge concentrate on points?" Phys. Educ., vol. 24 no. 3 (May 1989), pp. 157-161, https://doi.org/10.1088/0031-9120/24/3/309. Available as a PDF file here. C. A. Spindt, "A Thin‐Film Field‐Emission Cathode," Journal of Applied Physics, vol. 39, no. 7 (June 1, 1968), pp. 3504-3505. Charles A. Spindt, Kenneth R. Shouldersand Louis N. Heynick, "Field Emission Cathode Structures And Devices Utilizing Such Structures," US Patent No. 3,755,704, August 28, 1973. LI> H. Dyball, "A diamond in the making," Electronics Letters, vol. 47, no. 16 (August 4, 2011), pp. 890ff., DOI:10.1049/el.2011.2314. Jin-Woo Han and Meyya Meyyappan, "Introducing the Vacuum Transistor: A Device Made of Nothing," IEEE Spectrum, June 23, 2014. Shruti Nirantar, Taimur Ahmed, Guanghui Ren, Philipp Gutruf, Chenglong Xu, Madhu Bhaskaran, Sumeet Walia, and Sharath Sriram, "Metal–Air Transistors: Semiconductor-Free Field-Emission Air-Channel Nanoelectronics," Nano Letters, Article ASAP (November 16, 2018), DOI: 10.1021/acs.nanolett.8b02849. A PDF file of supporting information is available here. Michael Quin, "Solution for next generation nanochips comes out of thin air," RMIT Press Release, November 20, 2018. John Boyd, "New Metal-Air Transistor Replaces Semiconductors," IEEE Spectrum, November 30, 2018. Linked Keywords: Atom; field trip; laboratory; Le Moyne College; Syracuse, NY; research; field ion microscope; field ion microscopy; magazine; scientist; computer monitor; imaging screen; sight; reflection; reflected; light; eye; magnification; magnify; optical microscope; human sense; Belgian; surrealism; surrealist artist; René Magritte; idea; oil painting; The Treachery of Images (La trahison des images, 1928–1929); image; smoking pipe (tobacco); smoker's pipe; caption; Albert Einstein; lecture; Vienna; copyright; copyrighted; low resolution; Wikipedia; digital photography; photograph; Ferdinand Schmutzer (1870-1928); Adam Cuerden; Wikimedia Commons; metal; nanometer; radius; vacuum chamber; gas; helium; argon; neon; etching; electropolishing; electrolyte; electrical polarity; positive; voltage; cathode ray tube; kilovolt; phosphor; ionization; ionize; perpendicular; surface; magnification; magnify; electrical conductor; electrical potential; field line; point (geometry); angle; angular; divergence; electric field gradient; acceleration; accelerate; straight line; physicist; spherical cow model; sphere; approximation; approximate; geometry; electric charge; mathematical model; calculation; calculate; Inkscape; electron; electronic device; vacuum tube; electronic component; electronics; 1950s; electric heating; heated; hot cathode; thermionic emission; cathode ray; electron beam; Field emission of electrons; Fowler–Nordheim equations; Charles Spindt; colleague; Stanford Research Institute (Menlo Park, California); 1970s; field emitter array; miniaturized field emission version of a vacuum tube; Google Patents; research; Vanderbilt University; diamond; material; work function; voltage; transistors; vacuum; channel; field-effect transistor; NASA Ames Research Center (Moffett Field, CA); volt; mean free path; electron; atmosphere of Earth; air; Functional Materials and Microsystems Research Group; RMIT University (Melbourne, Australia); electrode; molecule; artist's impression; artist's conception; gas molecule; Moore's Law; semiconductor; Australia; Australian; nanolithography; decade; electric power; high frequency; heat; energy; electron beam lithography; tungsten; gold; platinum; gate; dielectric; symmetry; symmetric; electric current; nanoampere; quantum tunnelling; Schottky emission; theory; theoretical; terahertz; melting; efficiency; current-voltage (I-V) curve; Gnumeric; physical vapor deposition; deposit; doping (semiconductor); temperature; thermal; oxide; oxidation; silicide; Shruti Nirantar; Doctor of Philosophy; Ph.D.; author; scientific literature; paper; glass; plastic; elastomer; deflection; flexible; wearable technology; radiation hardening; radiation resistant.